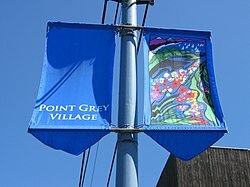 West Point Grey is a neighbourhood on the western side of the city of Vancouver, British Columbia, Canada. 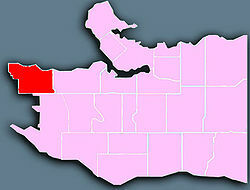 It is bordered by 16th Avenue to the south, Alma Street to the east, English Bay to the north, and Blanca Street to the west. Today, it's one of Canada's most expensive residential areas, with Point Grey average home prices sitting above the $3 million mark. The main commercial strip with shops and restaurants is along West 10th Avenue between Tolmie Street and Discovery Street. Fiesta Days, a family oriented carnival, is held along 10th Avenue and Trimble Park in June, with rides, games, performances and a parade. North of West 4th Avenue, the area slopes steeply downhill where it meets English Bay at Locarno Beach and the Spanish Banks. The 39 Canadian Brigade Group, headquarters for all the Canadian Forces's Army Primary Reserve units in British Columbia, no longer has its headquarters in the northeastern section of the neighbourhood. Located within the neighbourhood is Vancouver's largest youth hostel. Schools include Lord Byng Secondary School, which serves students from the neighbourhood, along with Our Lady of Perpetual Help, Queen Elizabeth Elementary School, Queen Mary Elementary School, École Jules Quesnel and the private PreK-12 school West Point Grey Academy. According to ancient First Nations legend, Point Grey is the "Battleground of the West Wind." The rock the god of the West Wind represents, which is just sitting off the point, is called Homolsom. 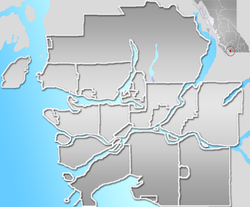 As the rock is just sitting between their two territories, Homolsom is half a Squamish word and half a Fraser River language word. Point Grey is named for Captain George Grey, a friend of Captain George Vancouver. Italics indicate neighbourhoods now defunct. This page was last edited on 8 January 2019, at 05:09 (UTC).